Can we say we have a possible 6th-c. source including a presumably earlier source showing a Greek text of the “Three Heavenly Witnesses” passage in 1 John 5:7? I don’t think so; a 6th century source that *might* refer to a Greek text of the Three Heavenly Witnesses (I’ve not got into the arguments about whether it does), and may be based on an earlier source. I’d be interested in your thoughts on “the strange book of Josephus Christianus”. His sole extant work, the Hypomnesticon, is a compilation of OT history, mostly drawn from Josephus the Jewish historian (hence the author’s names Christianus or Hypomnesticus). Josephus Christianus was once thought to be a fourth or fifth century figure (e.g. Jewish convert, Josephus of Tiberias etc), probably because of a misunderstanding of the title, which basically means “notes from Josephus”. The Hypomnesticon is now assigned to an anonymous author from the 9th or 10th century. It’s quite interesting to see how the author was given a life story and used as an authority until more rigorous analysis showed it was a late compilation. I might write up this material as a post, including your own notes. There seems to be a single manuscript, a 1733 publication, and the Grant/Menzies edition and translation. I’ve been trying to get hold of the latter, but no luck so far. Not a problem, Roger. I had never heard of this guy or work before but it turns out he may be quite useful for something I am writing at the moment! I look forward to your post. Lutheran theologian Friedrich Balduin (1575-1627) used the Ps-Ath. Synopsis a few times in his Commentarius In Omnes Epistolas Beati Apostoli Pauli. 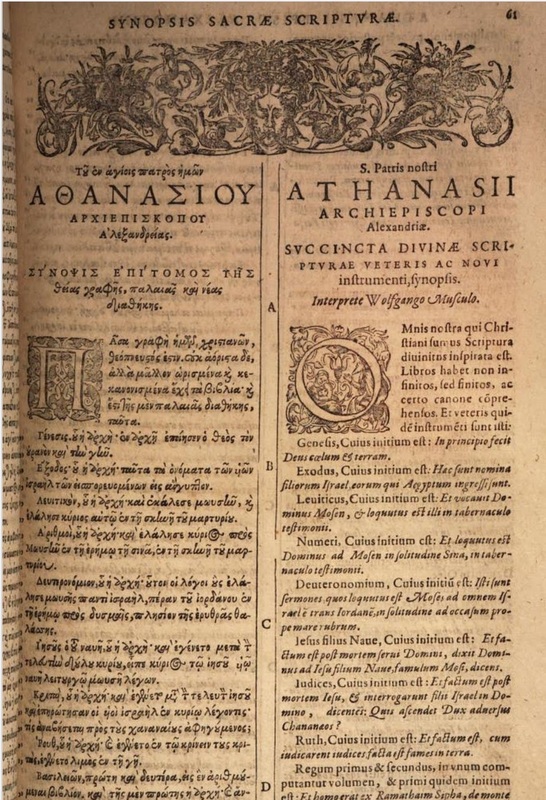 Before he comments on 2Cor, Gal, or Eph, for example, he provides a little “argumentum… ex synopsi Athanasiana.” Probably from the 1600 Musculus translation into Latin you linked in this post (thanks for that!). Balduin uses the Synopsis as a source for handy summaries of the contents of Paul’s epistles. Interesting to know – thank you.